The dust has settled and you've lived through the first and only Vice Presidential Debate of the 2016 presidential election. Unless you were one of the time-traveling GOP website writers who had their debate reactions online before the debate started, you had to sit through it with the rest of the world and experience it in real time. This means you had to watch every interruption and every fatherly eyebrow raise and head shake. Twitter was a hub for some of the best reactions, including passing around some older tweets to remind us who, exactly, the two candidates were. Tim Kaine's kids BEGGING him not to wear the funny tie tonight, the one with the big cheeseburger screen-printed on it. Here's a look at some of the night's best reactions to the debate. It includes a little sympathy for the moderator Elaine Quijano, just like there was last time for NBC's Lester Holt. MODERATOR: Backstage the nominees flipped a coin to determine who will give the first opening statement. Which one of you is Governor Pence? 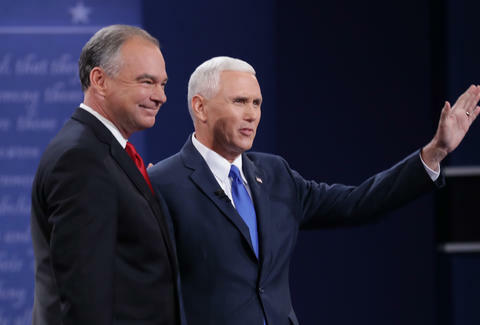 Pence: "My town is small"
Kaine: "My town is the smallest"
Pence: "My town doesn't even have people"
Kaine: "I'm not even from a town"
And then people went nuts for what was unfortunately the debate's most memorable line. If you somehow haven't had enough debating, the next presidential debate is on Sunday. It will be another debate featuring the heavyweights, Donald Trump and Hillary Clinton. And if you're still jonesing for more political jousting after that, maybe watching Alec Baldwin debate Kate McKinnon can get you through the four debate-less days before the next bout.